Here is the, long awaited, LAST post to the Homemade Hawkeye Costume. 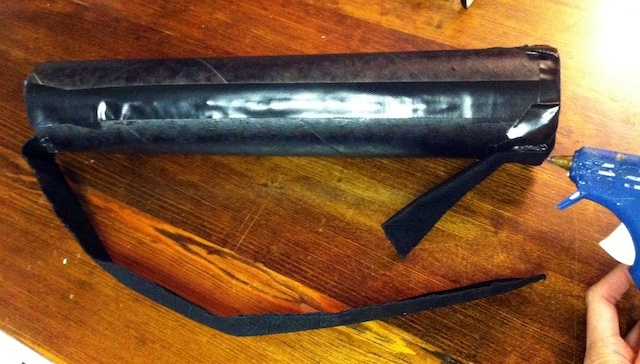 This is how I made the Quiver, an Archers case for holding arrows. We messed around with different materials that could be sturdy enough for play but lightweight so the child doesn't get tired of holding it! I figured the best material would be cardboard! This is also cheap and you most likely have it in your home already! 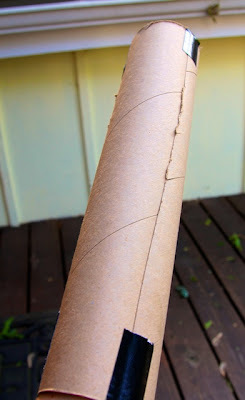 A tube of cardboard from wrapping paper. Black fabric or something you want to use for the strap. What I did first was removed wrapping paper from its cardboard roll . Then I cut the roll in half, giving me two equal halves (pictured). You want your Quiver a little larger then one of these so you need to combine them together to make your holder a little larger. If you are only making two arrows... You actually don't need to do this step because they will fit in one of the halves of cardboard. 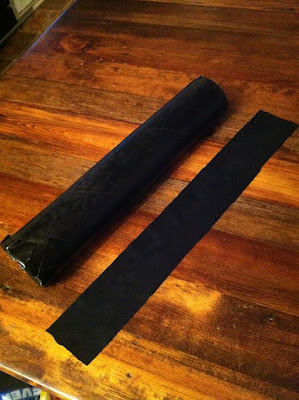 To expand the holder I cut a straight line down the length of both rolls. Eyed how much more cardboard I wanted to use to expand and then cut the excess cardboard from one of the rolls. The second picture on the right shows that I added about a three inch width section to expand the cardboard. I then used my tape to hold it in place. You could also just use a stapler for this part. Then I hot glued the rest of the edge, down the line. *The next step is to spray paint the cardboard... Since my son is dressing up as Hawkeye, we used black. *Now you will be making the strap. I chose to use the same fabric I bought for the finger glove, simply because I had it.... also I love the look of leather that it has. 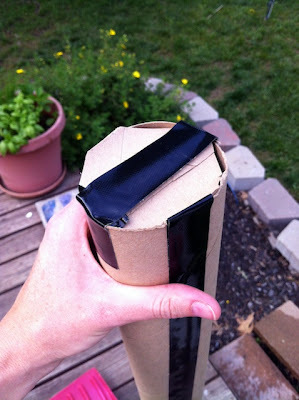 However, you could use anything you want for this, example black elastic or even black duct tape folded in half (get creative). I cut two pieces of the black fabric. 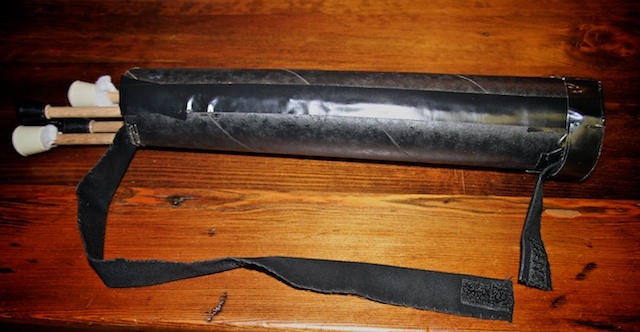 One about 19 inches long and the other about 5 inches. I folded the fabric in half, it made it about 1 1/2in. 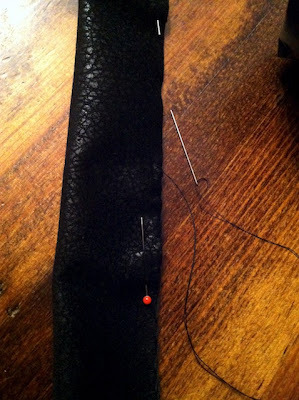 wide, and simply hand stitched the three edges together with black thread. I measured the lengths of the fabric specifically for my son... many different children from our neighborhood have put on the quiver and it works for them too. 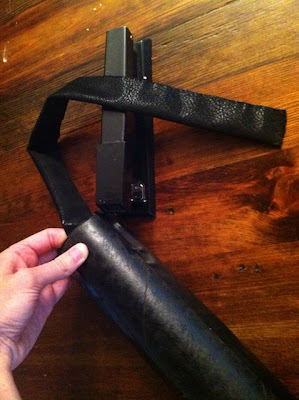 However, just incase, before you do any stapling check out if you are making the straps so the Quiver fits on your child. *Tip, you want the Quiver kind of tight on your child... you don't want it to be hanging and swaying when your child is running. Then fold about an inch of fabric in to the top and bottom edges and staple the two different lengths of fabric to the cardboard. This picture is just meant to show you both straps. I actual hot glued one edge and din't like how it turned out so I'm telling you a better way to make it! However, now you should have one LONG strap and one shorter strap stapled to your cardboard. 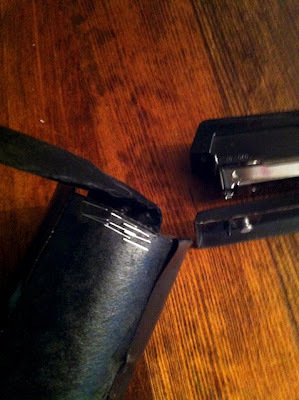 I then sewed a piece of velcro onto the ends of the straps. Depending on what you used for the straps...You can also hot glue the Velcro on. *Now you will cover the end with the shorter strap because that is the bottom of the Quiver and we need our arrows to stay put! Like I said above, I did this before adding the straps and I now think I should have done this step last... It works really well if BOTH straps are STAPLED to the cardboard before the bottom is taped on!!! Cut out a bit of cardboard from your leftover piece. Make it kind of fit into the bottom, filling in the circle. 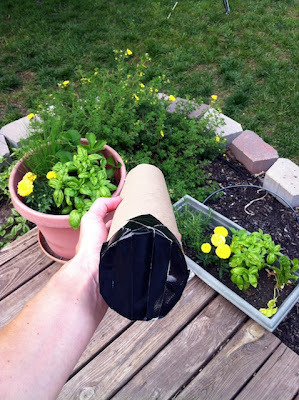 Then use your strong tape and tape down the whole thing, basically covering the whole bottom. You can make it look clean by covering the bottom side view with one more piece of tape around the bottom just so you don't see all of the little pieces coming together.... (pictured above in the side view). 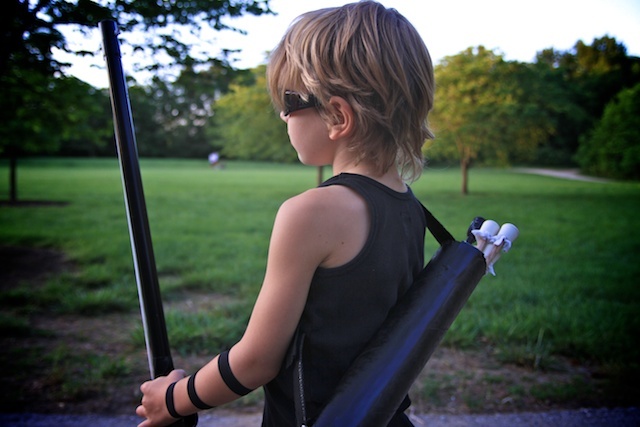 Here is a picture of my son with the Quiver on from the front. It is great that the velcro connects at a lower point and it's very comfortable to wear! 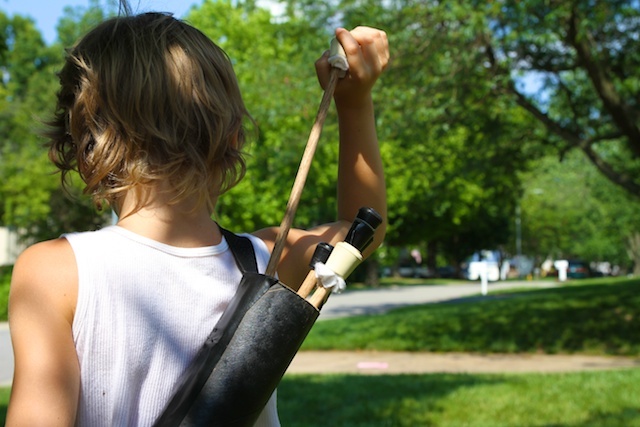 The length of the strap holds the Quiver in a good place and makes it easy of him to pull out his arrows just by reaching back! 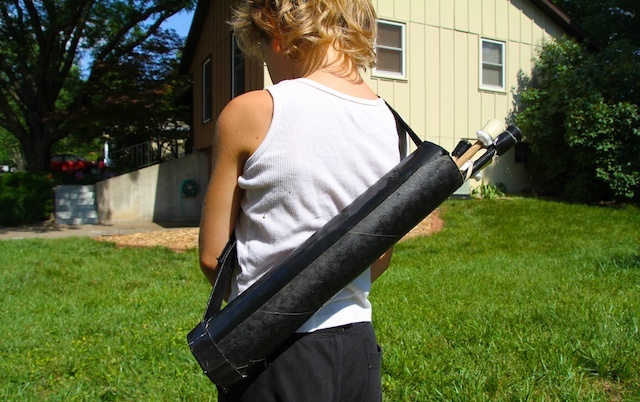 There you have it, a nice lightweight and comfortable Quiver for your little HAWKEYE or Archer! I just wanted to add something fun about this Quiver. My son loves to dress up! He sometimes will just wear this Quiver to hold his swords because of the easy access to pull them out over his shoulder! So this is a fun item to add to the costume box even if you aren't going to make the Bow and Arrows! 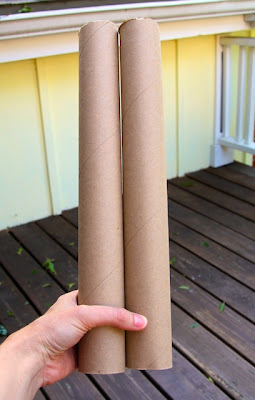 I got a mailing tube to use...cost more but came out more sturdy than the wrapper paper role...just another option! My son's is holding up well but that is another great option to make the Quiver! 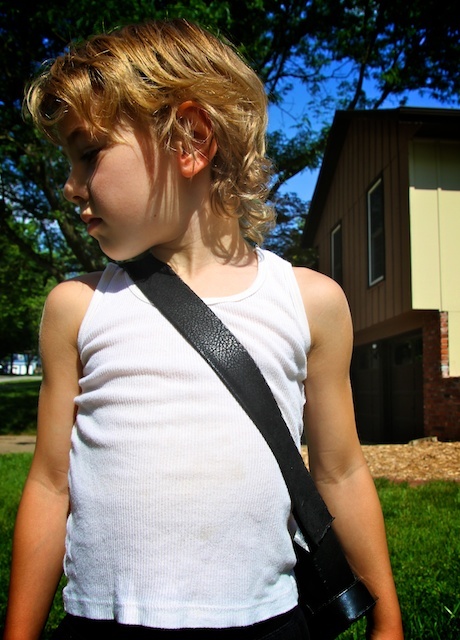 You see the white T-Shirt your son is wearing, when he dresses up, do you get him to wear a leathery black t Shirt? He normally wears a black tank top.... but I am probably going to make him a vest like hawkeye! If I end up making one, I will be sure and post it! I used a Pringle's can! Oh my gosh Heather! What a great idea!!!! Thanks for the tip!! !